The story of the American mind and heart during the past fifty years, told with ironic wit and deep nostalgia; a book to make you enjoy the past and understand the present; a cavalcade of America that both recreates and interprets the most extraordinary era of our history. In 1896, Americans serenely faced the future. They were moving along the highroad of progress, and moving fast. Just beyond the horizon lay the promised land. They differed chiefly about the best means of reaching what was so obviously attainable. Under the circumstances to be a pessimist was to be a queer fish. In 1946 their mood was very different. During the interval, their physical and social environment had been completely transformed. They had advanced, as no other nation in history, toward power, wealth, and material possessions. In the common view, these were what made existence more secure and more satisfying. But few Americans considered life as secure and satisfying as it had been fifty years earlier. Confidence and faith had evaporated. Skepticism was commonplace. Pessimism. was no longer eccentric. The weather had shifted from fair to overcast, and the American dream had taken on the quality of a mirage. in terms of the journalists, writers, philosophers, and religious and social leaders who have shaped our contemporary culture and helped make the moral weather in which we are living today. 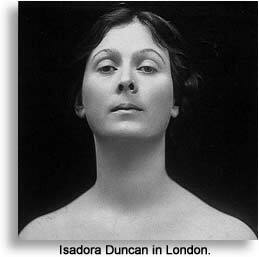 ISADORA DUNCAN's love affairs were numerous and she embarked on every one as if it were destined to be perfect and permanent. She was less promiscuous than psychically virginal. Men failed her with tedious unanimity. She asked nothing of them - except perfection. 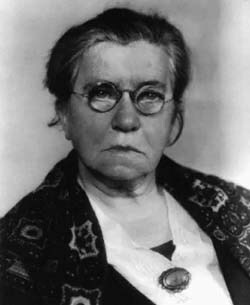 Short, stocky, exceedingly plain, EMMA GOLDMAN looked like a strong-minded, respectable housewife. She was strong-minded, no housewife, and anything but respectable. Her Prim white shirtwaist and black skirt disguised a proletarian Aspasia whose tempestuous love affairs, whatever their private Passion, were always public demonstrations of a theory. Emma Goldman loved theories with an indiscriminate ardor. The violence of her affection for ideas was equaled only by the violence of her antipathy to capitalists and reformers. As she was convinced that every attractive idea ought to be adopted, her life-except for intervals spent in prison-held few vacant moments. In the phrase of the day, she "believed in experience". So her path was littered with abandoned lovers and discarded philosophies. To all of them she had been faithful, in her fashion. Each had seemed irresistible-for a while. DUTCH SCHULTZ performed a traditionally approved economic function. By effecting the consolidation of independent units, he eliminated waste, promoted efficiency and replaced the disorder of an obsolete individualism with rigorous discipline.... He cheerfully recognized the "right of the inefficient to die" and made himself its willing instrument. Death solved the problem of competition. Like Mrs. Stuyvesant Fish, MISS TEXAS GUINAN wished to redeem her world from the cardinal sin of dullness. Like Mrs. Fish, she was singularly free of illusions and possessed a notable talent for imaginative insult. Seated in the center of her nightly bedlam, her diamonds blazing and her gown shining with sequins, armed with a clapper and police whistle to ward off any intolerable momentary silence, she, would welcome patrons with a-, loud, cheerful, full-throated "Hello, sucker! ". . . . Life, as she saw it from her table, had the look of madness and she took a malicious pleasure in abusing it, making it more wacky, stepping up its frenzy.... By nature, she was a small-town woman, inclined to simple decencies.